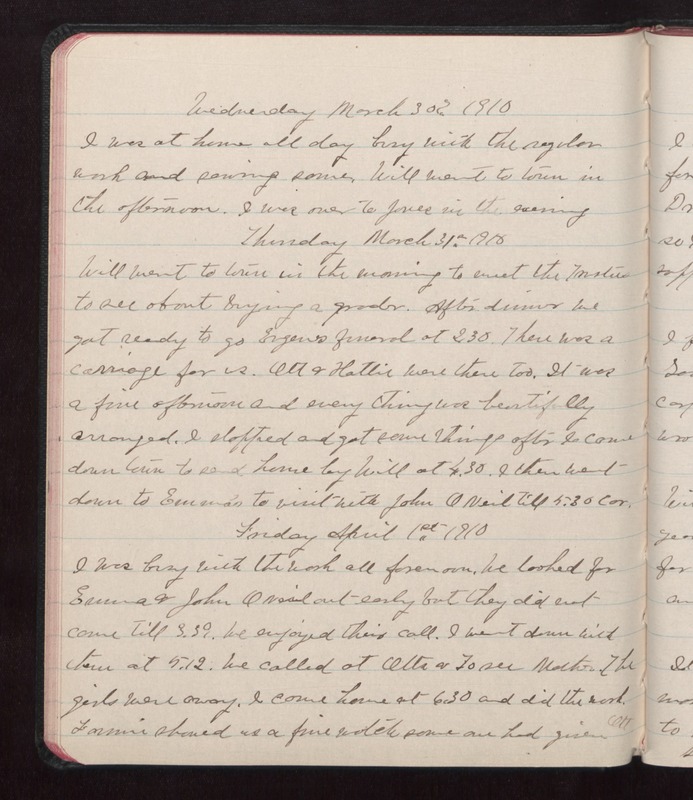 Wednesday March 30 1910 I was at home all day busy with the regular work and sewing some. Will went to town in the afternoon. I was over to Jones in the evening Thursday March 31 1910 Will went to town in the morning t meet the Trustees to see about buying a grader. After dinner we got ready to go to Eugene's funeral at 2.30. There was a carriage for us. Ott & Hattie were there too. It was a fine afternoon and every thing was beautifully arranged. I stopped and got some things after I came down town to send home by Will at 4.30. I then went down to Emma's to visit with John ONeil till 5.30 car. Friday April 1 1910 I was busy with the work all forenoon. We looked for Emma & John ONeil out early but they did not come till 3.59. We enjoyed this call. I went down with them at 5.12. We called at Otts & to see Mother. The girls were away. I come home at 6.30 and did the work. Fannie showed us a fine watch some one had given Ott.